Abies × insignis, first described by Elie-Abel Carrière (1818–1896) ex Jacob Whitman Bailey, is commonly known as Insignis fir. 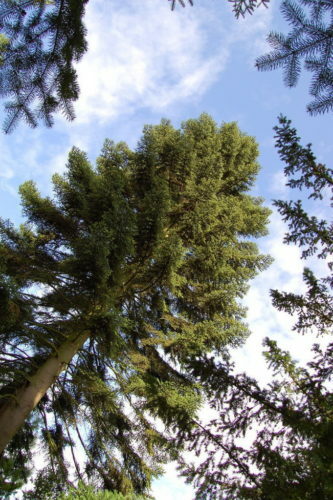 It is an artificial hybrid of Caucasian fir (A. nordmanniana) and Spanish fir (A. pinsapo). It originated around 1850 at the Leon Renault Nursery, Bulgéville, France (Vosages). Description. Insignis fir will quickly grow to become a large coniferous tree up to 100 feet (30 m) tall with exceptionally dense foliage. Bark is ashy-gray or whitish. Branchlets are brown in color, pubescent at first, later becoming glabrous. Needles are linear, straight or sickle-shaped, 0.8 to 1.2 inches (20 - 30 mm) long and (2 - 3 mm) broad, glossy bright green in color with 2 whitish stomatal bands beneath. Seed cones are very similar to A. pinsapo. The current champion tree of this species is at the Schovenhorst Country Estate, Putten, The Netherlands. Its height was exactly 105.6 feet (33.00 m) with a trunk 9.5 feet (2.97 m) wide at breast height when measured on Dec 9, 2010.